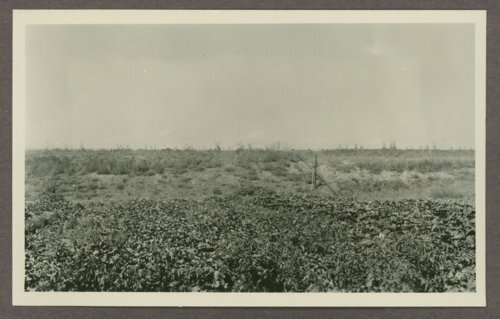 This is a photograph showing a garden grown by Roy Phelps in Sheridan County, Kansas. The dam which forms the farm pond is shown in the background. Water was conveyed from the pond to the garden through the pipe across the dam. The photograph was removed from the Relief Garden Program of 1935 portion of the Kansas Emergency Relief Committee collection.